Microsoft PowerPoint can add a visual dynamic to your business meetings and presentations hence the need for a meeting room installation in Ottawa. The greatest way to share a presentation with a big group is to project your slides on a screen using a digital projector connected to your computer’s video output. Most tablets and modern computers have an in-built Video Graphics Adapter (VGA) or High Definition Multimedia Interface (HDMI) video output or you can output video to one of those formats through a third party adapter. The steps below offer a few general tips that may be of help in setting up your projector for a presentation. Most desktops and laptops have an outer video port at the side or at the back, while most projectors have a video input connection. Depending on the type of connector on the projector and PC, a standard conference room installation in Ottawa uses DVI or VGA cables to connect the computer to the projector. To use your computer with a projector, activate the external video port. Some computers have a key that you can press to achieve this. Others necessitate you to change the display settings. If you cannot figure out how to make the switch, try right clicking an empty area on your computer and select properties. This brings up a properties dialog box. Click the Settings tab and then click Advanced and look for a setting to enable the external video port. When you finish your presentation, change your computer back to its normal video port setting before you detach the projector. Most projectors accept input from more than one source. You might be able to connect a computer and VCR to the projector. The projector should have some buttons or a menu that allows you to select the input used to display the presentation. 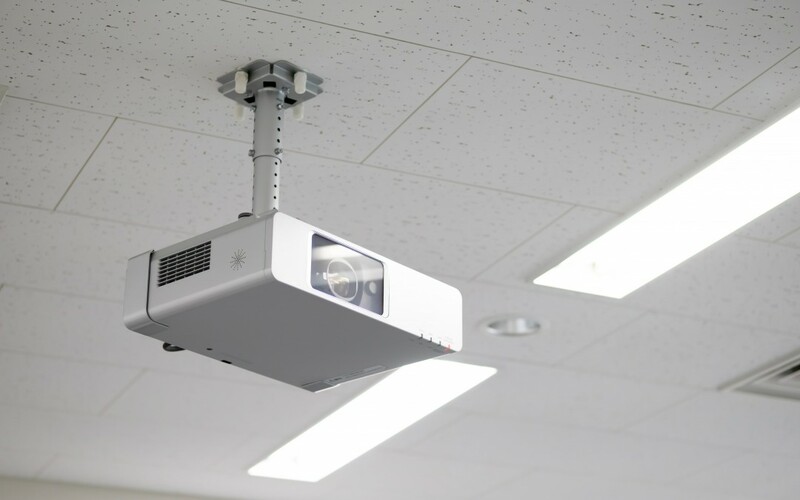 If you want to use the projector’s remote control to operate your presentation, you will need the correct cable to connect the projector to your computer’s USB or mouse port. This cable should come with the projector as part of projector screen installation Ottawa. If your presentation has sound, fix your computer’s sound outputs to a set of amplified speakers or a PA system. The correct cable depends on the PA system, but a cable with a mini stereo plug on one end and a quarter inch plug on the other will most likely work. It’s quite difficult to leave a lasting impression during a presentation. However, adding audio and visual signals is certain to make your presentation memorable. One of the best ways to improve your presentation and guarantee its success is to use a projection system. A meeting room installation in Ottawa will allow you to share new ideas, supporting information and share data easily while guaranteeing professionalism. Using a projector for presentations not only gives you as a speaker the control you need but also increases the chances of your audience’s understanding. Ultimately, projector screen installation in Ottawa plays a big role in helping corporations to operate efficiently.